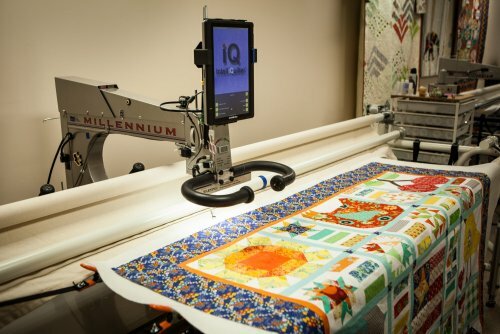 Take a class and learn to use our APQS Millennium longarm quilting machine with its computerized Intelliquilter quilting system. Your quilts will have a consistent pattern from start to finish. Come take the class, rent the machine, and finish your large projects in our studio! Before you can rent the Millennium machine you MUST take the basic class. Proper machine operation is the only way we are going to keep this machine running smoothly for everyone. The class is from 10:00 am to 12:30 pm for $75.00, which includes, a set of zippers to speed up the renting time, and instruction on the use of the APQS Millennium machine. Instruction covers how to load a quilt on the frame, machine operation, and practice using the machine on quilts. $20.00 per hour, using the machine in free-motion operation. $25.00 per hour using the IQ computerized system for an edge to edge pattern. Thread charge $10.00 per quilt. You must use our thread or an approved thread. Please use good quality batting. You are investing in your quilt; don't use products that are substandard. Thicker polyester battings may require machine adjustments that will add extra charges to your time. We carry packaged and 61" wide batting by the yard from Quilters Dream. To schedule a time to rent the Millennium, call and talk to Patty at the studio (972-661-0044). We will do all that we can to accommodate you and your schedule.